I’m Jamie. 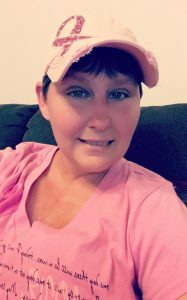 I’m 39, and I was diagnosed with stage 3 breast cancer on July 13, 2016. I had 8 rounds of chemotherapy and 6 weeks of radiation therapy. I had my mastectomy on March 6, 2017. My husband, children, step children, and family have been by my side through it all. They gave me the will and strength to fight on. I am currently cancer free! I am so glad you had such a great support team during this difficult time! You are a fighter!